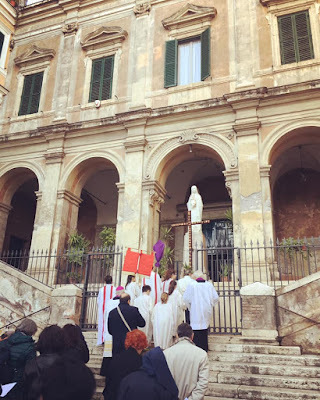 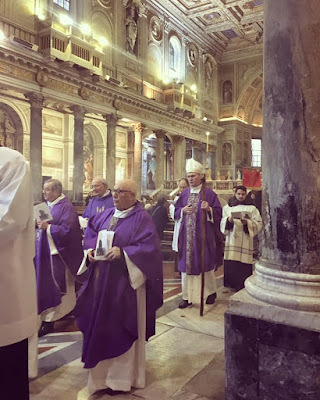 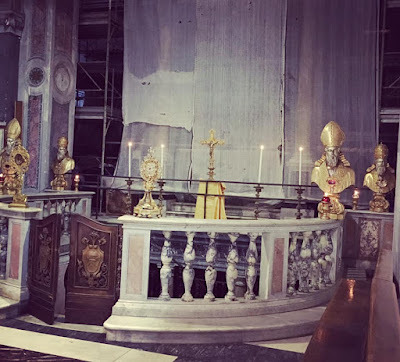 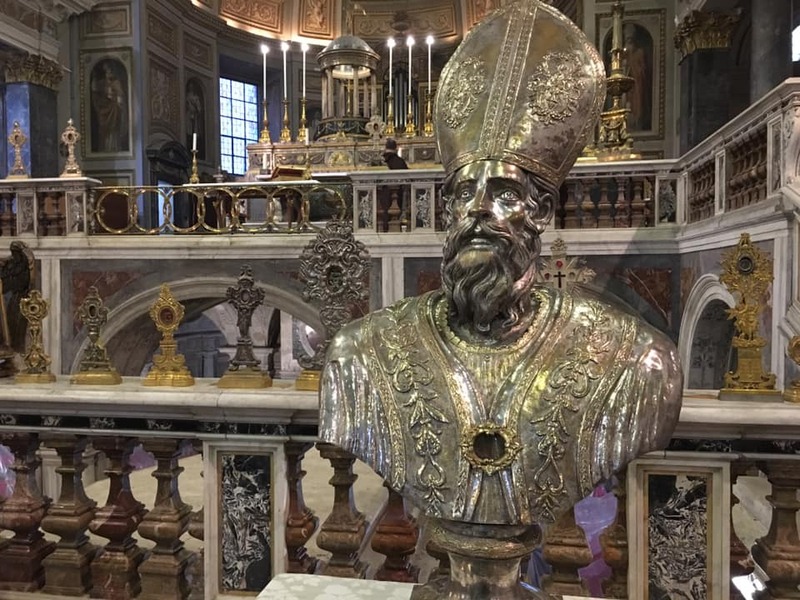 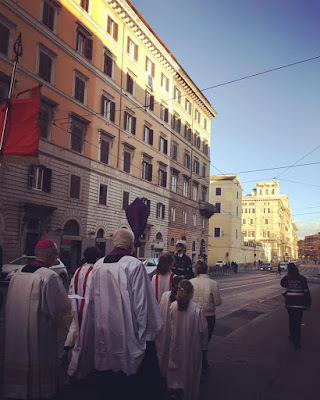 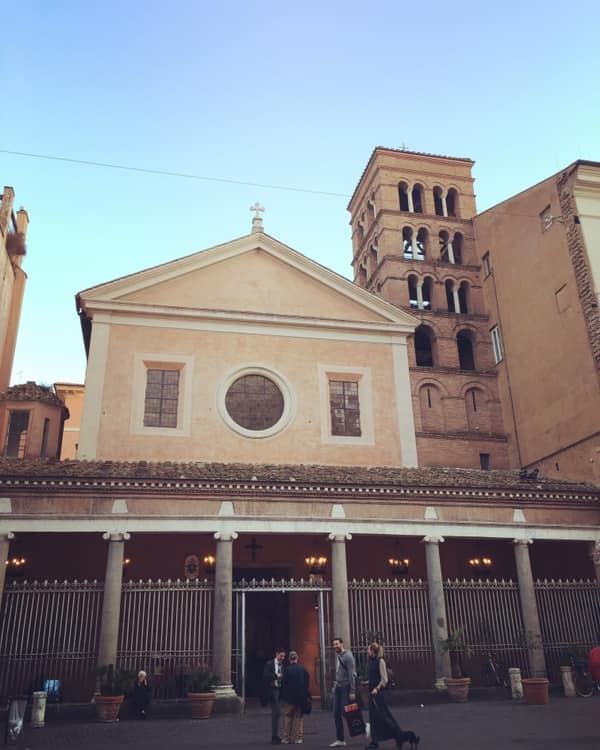 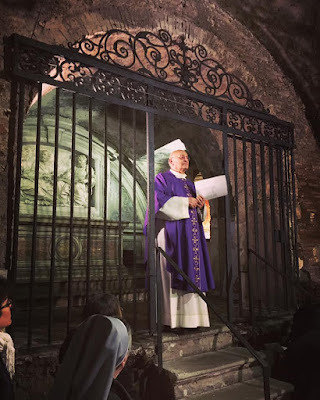 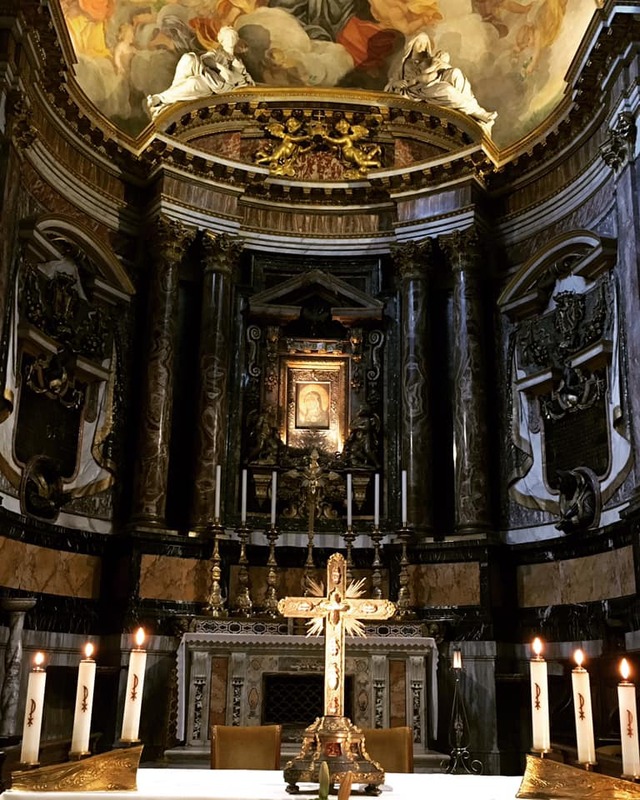 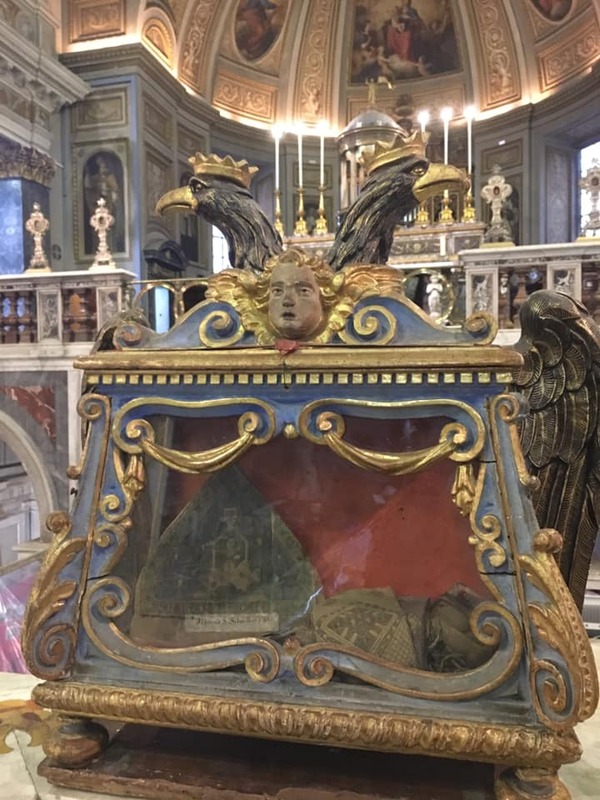 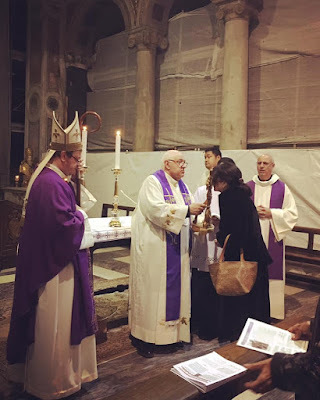 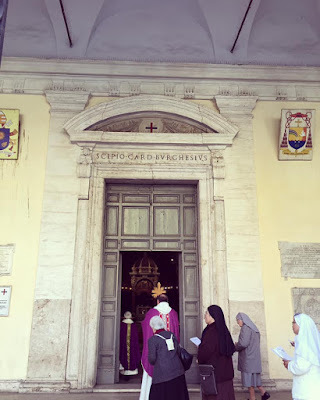 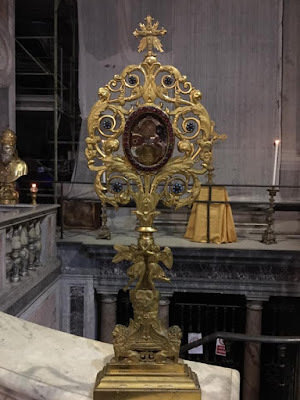 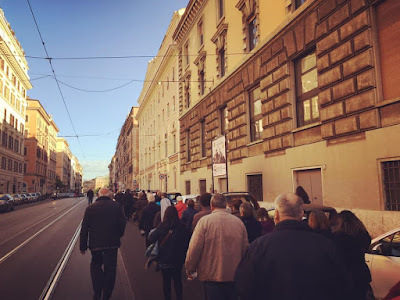 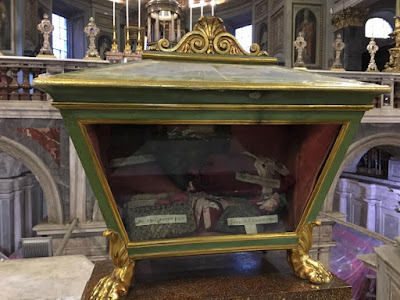 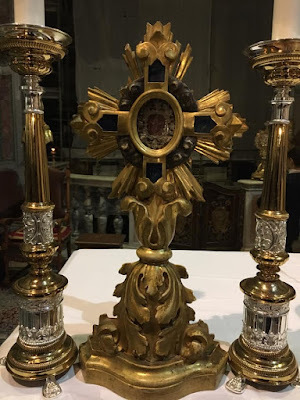 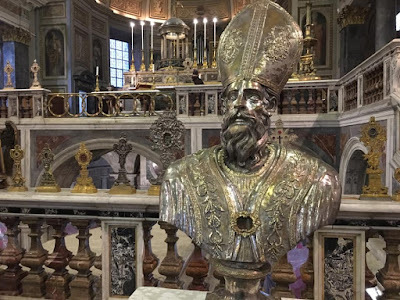 Due to a series of circumstances beyond the control of our Roman pilgrims, several stations in a row were missed this year - such is life, especially in Rome. 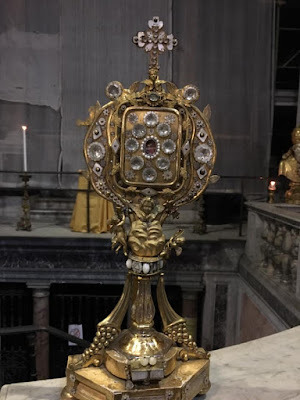 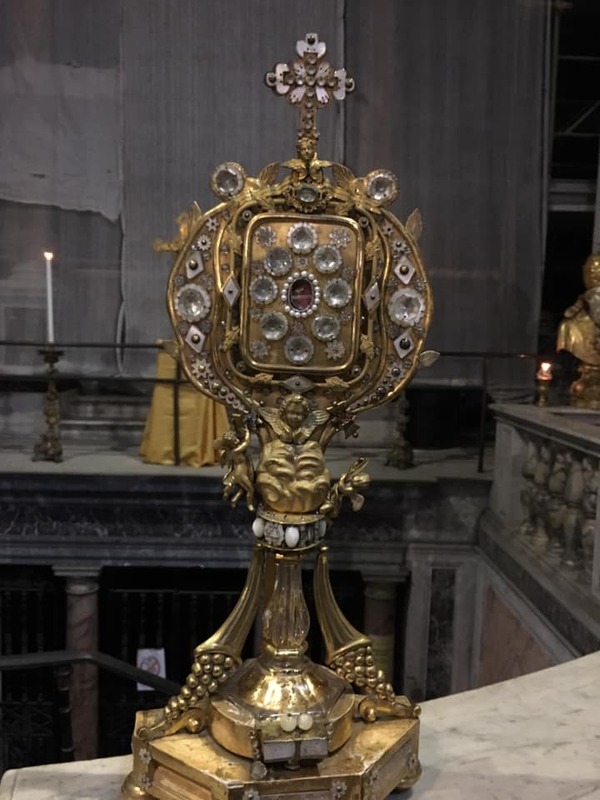 In compensation, we have a lot of really nice pictures of reliquaries! 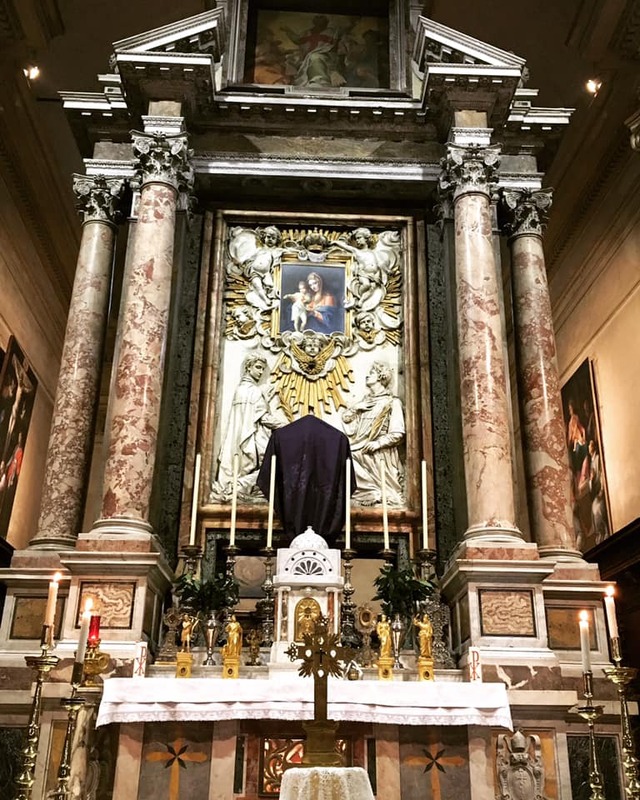 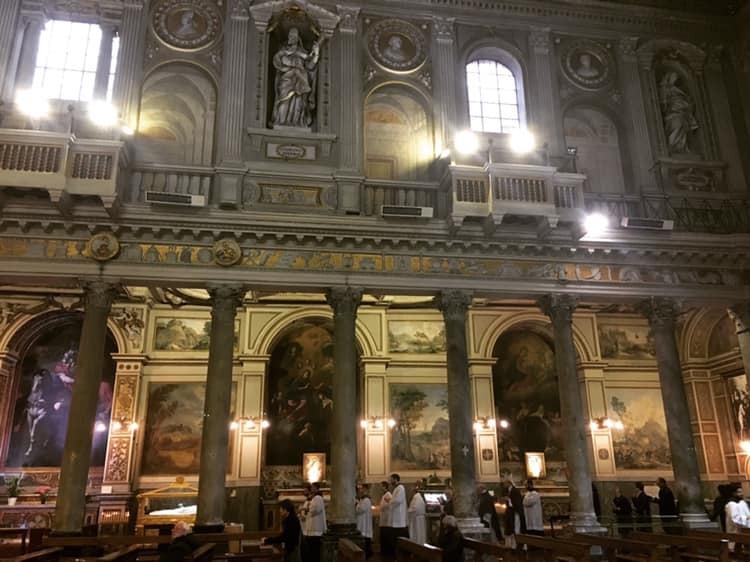 Since there are so many churches in Rome dedicated to St Lawrence, more even than to Ss Peter and Paul. 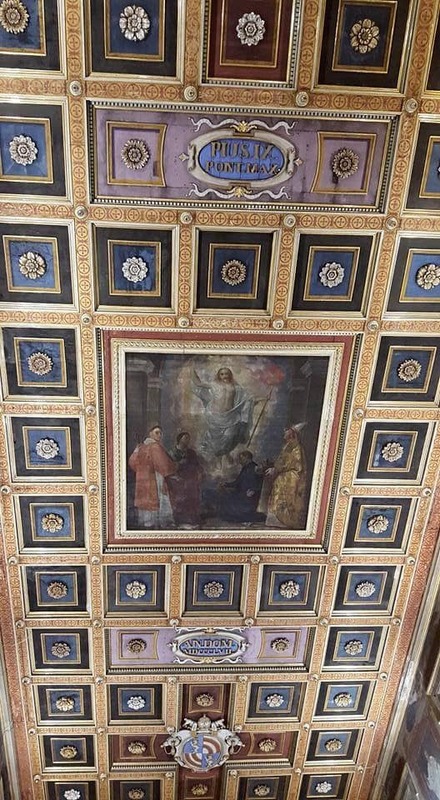 they are distinguished by various epithets. 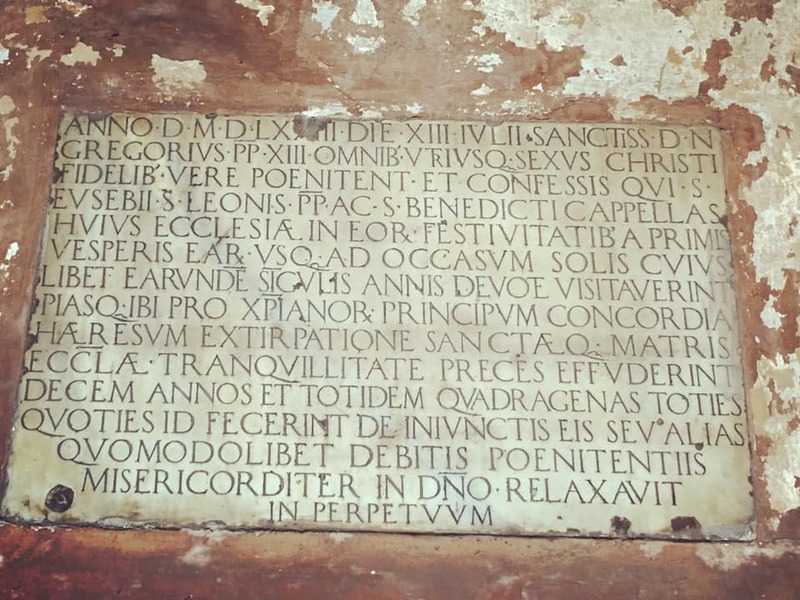 In this case “in Lucina” refers to the woman who is traditionally said to have buried St Lawrence, on the site of whose property this church was built. In the magnificent painting of the Crucifixion by Guido Reni (1575-1642) over the altar, the body of Christ is pale and white against a much darker background; one can see the body of Christ raised above the altar at a distance, even standing outside the church in the piazza, a reminder of the Elevation of the Host during the Mass. 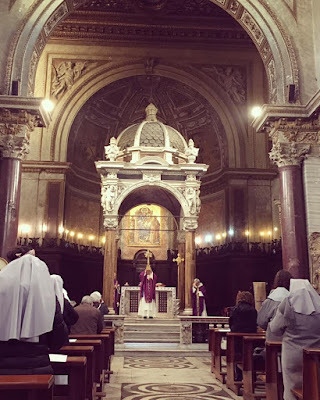 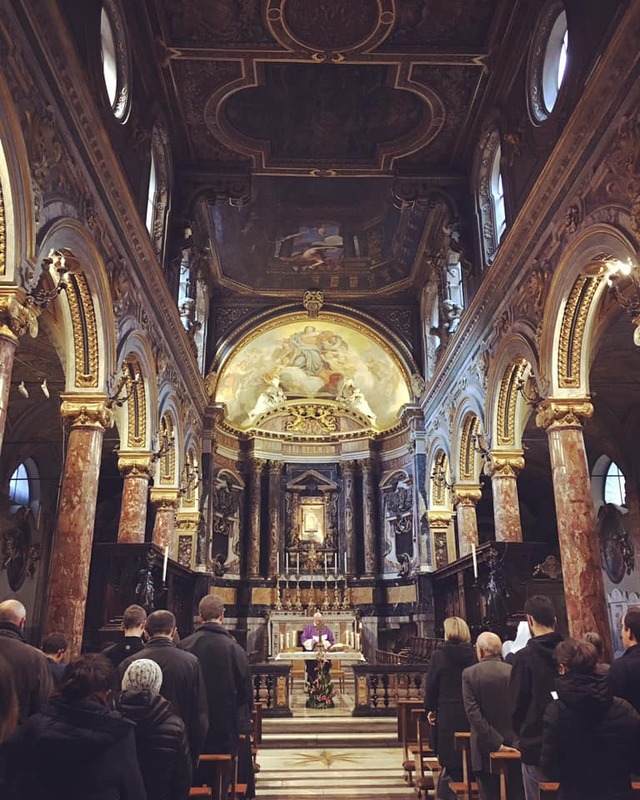 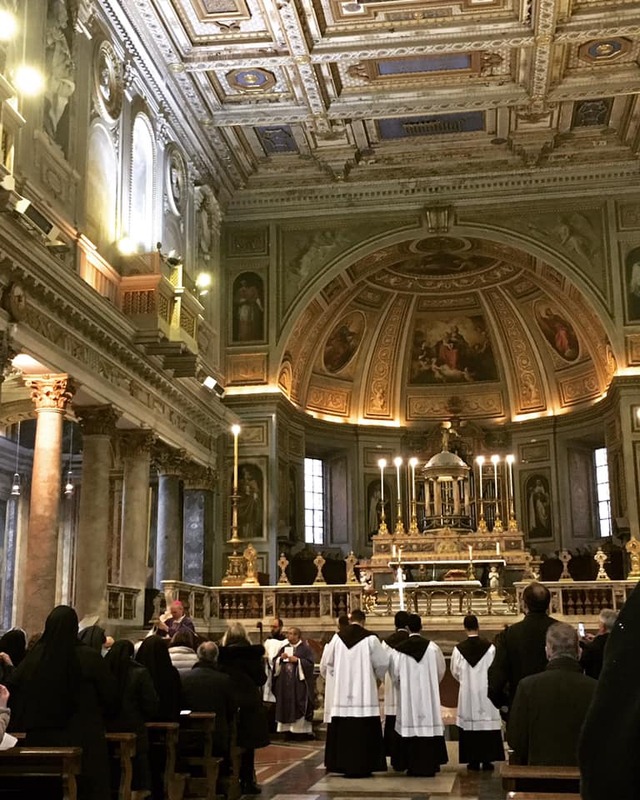 The church is run by the Carmelites of the Old Observance, whose generalate is next door; here we see some of them participating in the stational liturgy. 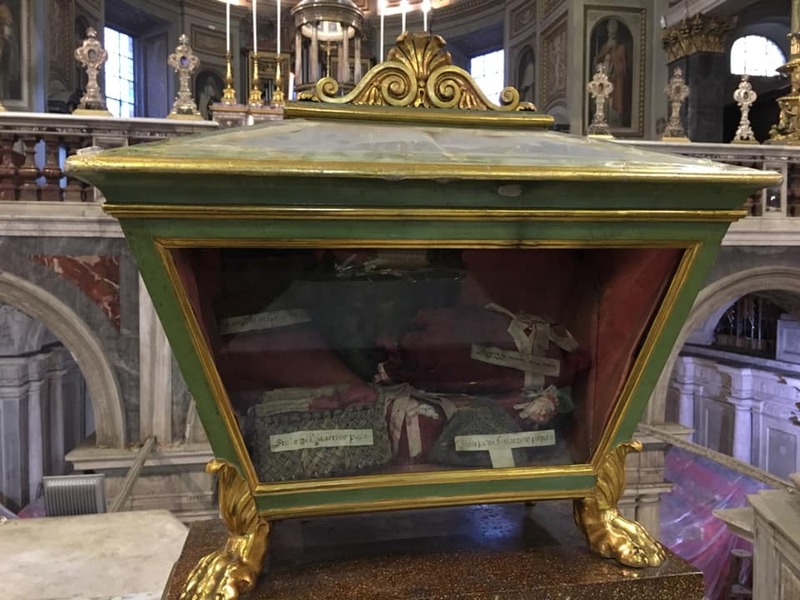 and others of Pope St Martin I (649-55), the last martyred Pope. 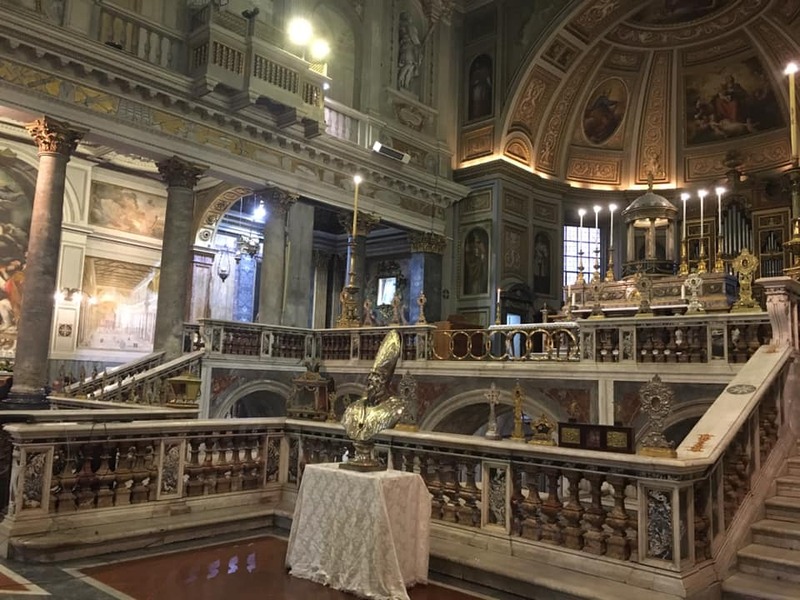 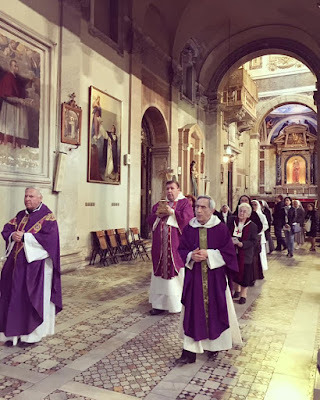 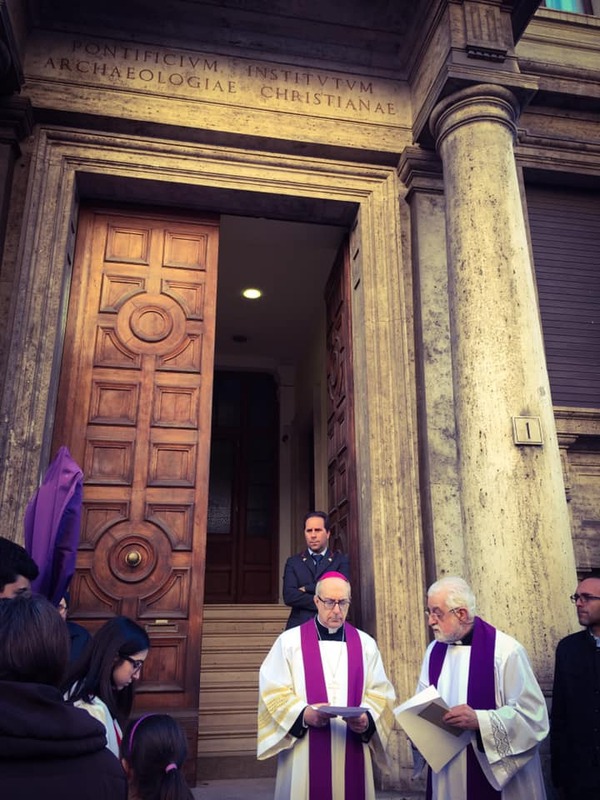 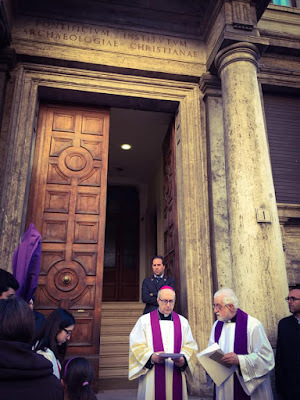 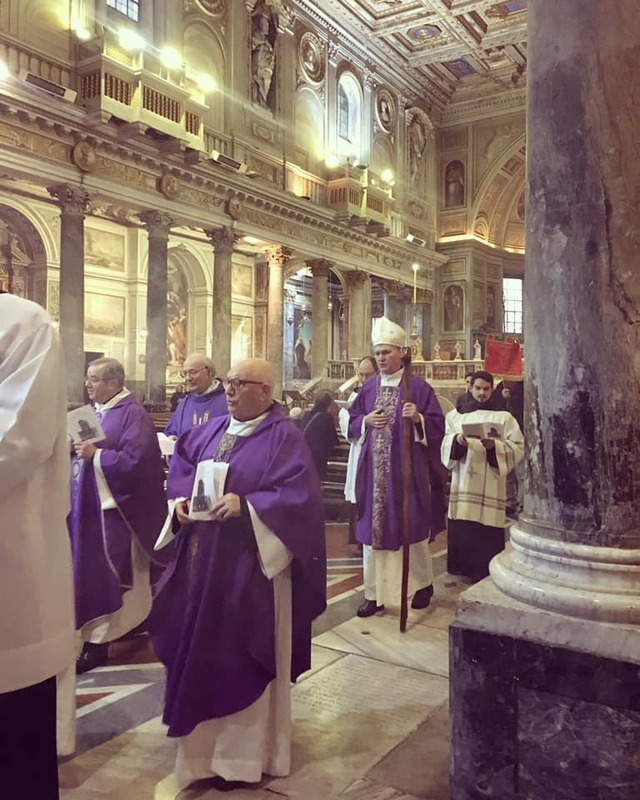 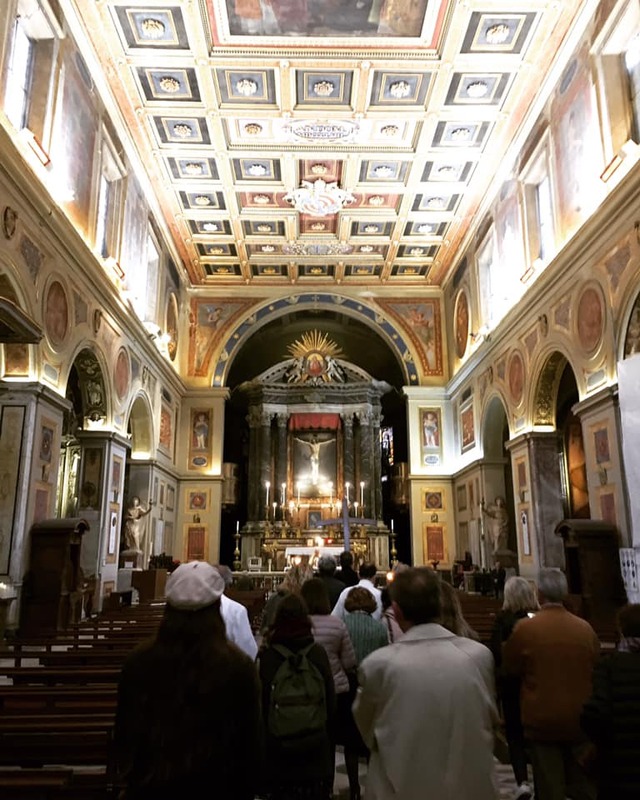 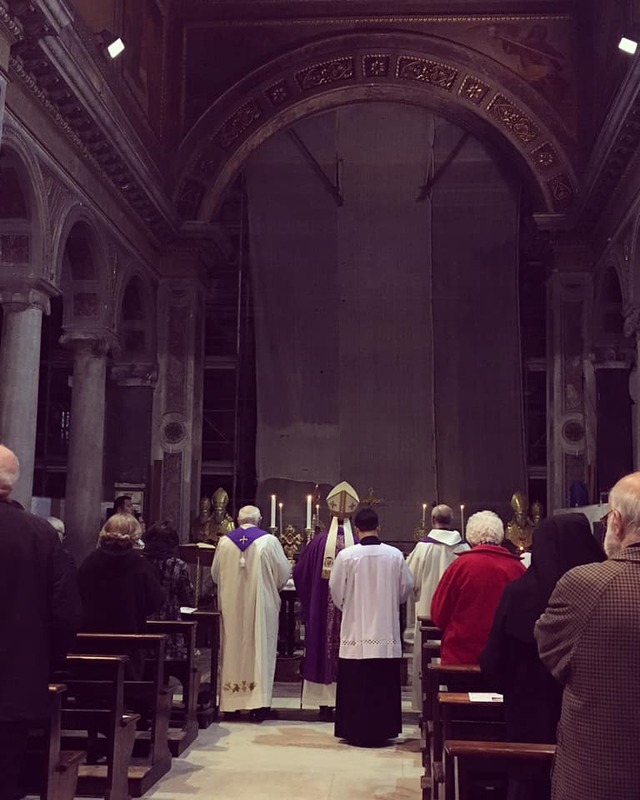 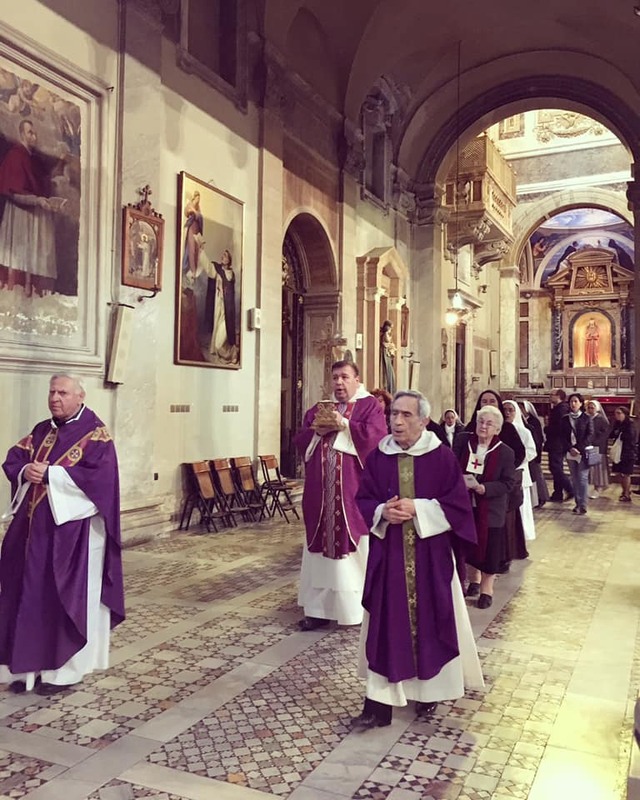 The ceremony began at the nearby Pontifical Institute for Christian Archeology, which has charge of many of the most ancient Christian sites in Rome, including the catacombs. 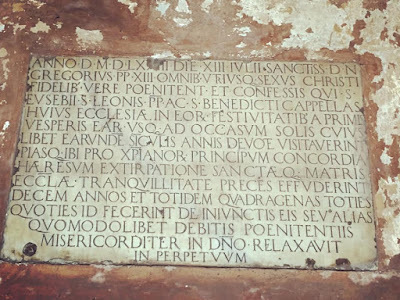 This inscription of the year 1582 records that Pope Gregory XIII granted indulgences of ten years and ten Lents for visiting the church on the feast of the titular Saint (August 14), and those of Pope St Leo I and St Benedict (at the time, April 11 and March 21 respectively), to whom two of the church’s chapels are dedicated. The peculiar title of this church derives from a late and unreliable tradition, according to which the Emperor Constantius imprisoned the titular Saint within the basement of a temple on this site for refusing to accept the Arian heresy. The entire apse is currently under restoration. 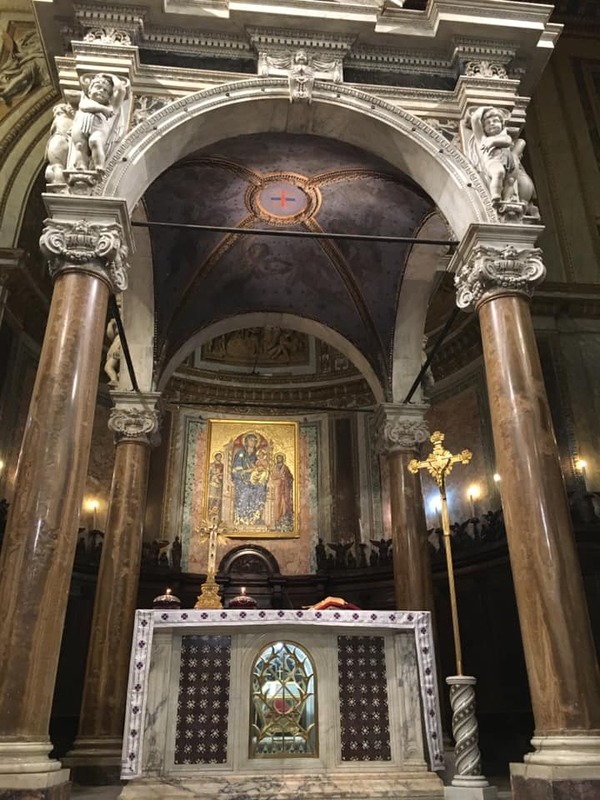 The church is in the care of the Trinitarian Fathers, one of the medieval ransoming orders whose mission was to rescue Christians captured and held as slaves in Muslim lands. 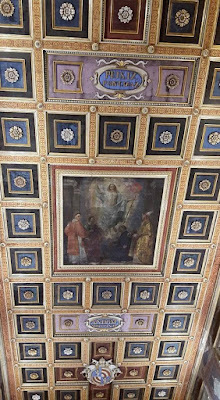 The red and blue cross seen here over the door, and below inside the baldachin of the high altar, is traditionally said to have been divinely revealed to their founders, Ss John of Matha and Felix of Valois, as their distinctive symbol. The church where this day’s station was originally kept, and which is still listed in the Roman Missal, dedicated to an early Roman martyr named Cyriacus, was demolished in 1491 to make way for the construction of Santa Maria in Via Lata, to which the station was then transferrred. 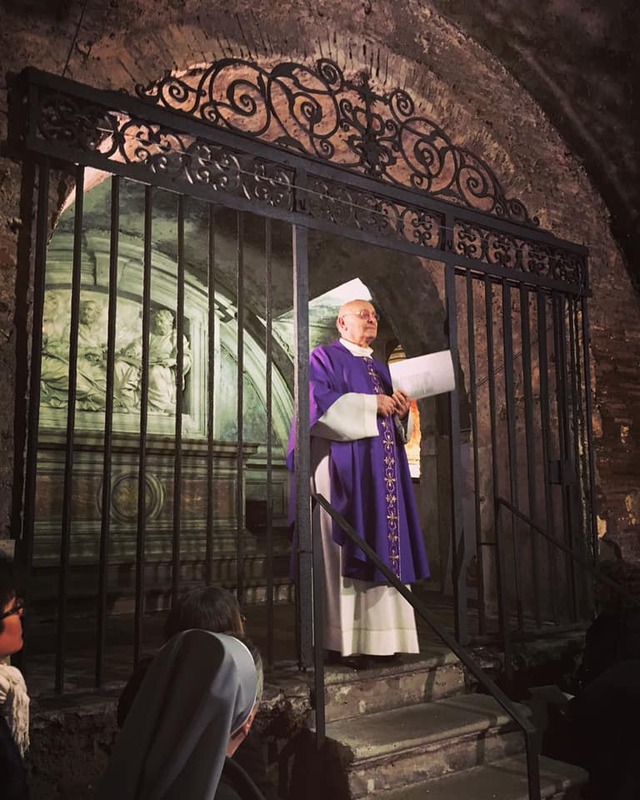 The crypt is partly the remains of an ancient house, traditionally said to be one of the places where St Paul stayed when he was in Rome.